Pittsburgh was organized as a borough in 1794 and incorporated as a city in 1816. Prior to 1800 the local inhabitants relied on river water for all household purposes. People complained that much of the spring water tasted of sulphur and wells were to hard to dig. Outsiders teased the townspeople with the claim that they stirred up the mud in the bottom of the water bucket before they took a drink. However, wells started to increase in number. The first documented effort to establish a public water system in Pittsburgh occurred in 1802 when the municipality had about 1600 persons. At that time, the burgesses passed an ordinance authorizing construction of four 47-foot deep public wells, with pumps, on Market Street. This project was actually the beginning of the public water supply in Pittsburgh. A public system was needed not just for sanitary reasons but because of the constantly increasing danger of fire. As time passed, the system of public and private wells became inadequate to satisfy the needs of the growing population. By 1820, the water problem had become acute. Lines of people formed in the morning before public and private wells, and every morning and evening women and children could be seen making their way to the rivers. Many households kept tanks in their back yards that were filled by old men using barrels on carts. The going rate for this water was 3 cents per tubful or 6 cents per barrel. Because of the growing population, and the increasing need for water, the city constructed a pumped water system utilizing Allegheny River water and put it into service in 1828. The river pumping station was located at the foot of Cecil Alley on the Allegheny River (Cecil Alley and Duquesne Way) and a 1,000,000 gallon holding reservoir was constructed at the corner of Fifth and Grant (the present site of the court house). The average daily pumpage of this original piped system during the first three years was 40,000 gallons of water per day. The small system at Cecil Alley was replaced in 1844 with an expanded system consisting of a larger pumping station at 11th Street and Etna and a larger reservoir (capacity = 7,500,000 gallons) on Quarry Hill. Part of the reason for the upgrade was to increase the capacity of the supply because by this time, the city had expanded to the Hill District east of Grant Street. Additionally, there were complaints about the amount of river water contamination near the intake of the Cecil Alley Pumping Station necessitating relocation of the intake upstream. Furthermore, the public works project aimed at cutting away Grant's Hill had left the original reservoir high in the air. The new pumping station at 11th and Etna was equipped with two steam driven pumps known as "Samson" and "Hercules" that had a combined capacity of 9 mgd (million gallons per day). These pumps functioned almost continuously until 1884, a period of 40 years. The cost of city water at this time was relatively cheap, with householders paying $3 to $10 per year, hotels $20 to $40, and factories $15 to $150. In 1848, the continued expansion of the city to the eastern hill section forced the building of an additional reservoir (2,700,000 gal) on Bedford Avenue and a small pumping station to pump to it. The town continued to grow and in 1867, 14 wards were annexed to the original city. This sudden addition of 35,000 people brought about a general shortage of the water supply. Additional pumping units were installed and a temporary pumping station was constructed at 45th Street and the Allegheny River in 1870. This station, with a capacity of less than one mgd pumped river water directly into the distribution system. By 1878 the population had increased to 106,000 people and daily water pumpage rose to over 15 mgd. In 1879 a 125,000,000 gallon reservoir (Now Highland #l) was put into service at the top of Highland Avenue and a river water pumping station to feed it (Brilliant Pumping Station) was erected on the river upstream of Negley Run. Another low service reservoir was constructed at the same time on Brilliant Hill. However, although practically completed, it was never actually used as part of the drinking water system but was rather converted into a park lake (Carnegie Lake). An additional reservoir, Herron Hill Reservoir, and a dedicated pumping station were added in 1880. Small tanks and pump stations were built to serve the Garfield and Lincoln sections of the city in the early 1890's. From 1897-1903, a 126,000,000 gallon lower reservoir (Now Highland #2) was constructed in Highland Park to serve the low-lying sections of the city along the Allegheny and Monongahela Rivers. This performed the functions originally intended for the abandoned Brilliant Hill Reservoir. Two major additions were made to the water system with the consolidation of the City of Pittsburgh and the City of Allegheny (Northside) in 1907, and the purchase of the Monongahela Water System (Southside) in 1908. The three waterworks were merged into a greater city waterworks. Throughout the 19th century, river water was pumped to homes and businesses with no treatment other than the crude settling of suspended solids that occurred in the holding reservoirs. This was typical of public water supplies throughout the United States and Europe at that time. By the end of the 19th century contamination of the Allegheny River had reached the point where there was an obvious need for some type of purification. Furthermore, it became apparent that, as was the case in other cities, waterborne disease was also a problem in Pittsburgh. While suspected for hundreds and probably thousands of years, it wasn't until the mid 19th century that it was finally documented that impure drinking water could negatively affect health. In 1855, the British physician John Snow clearly demonstrated that cholera epidemics occurring in London could be associated with piped river water originating in sewage contaminated sections of the Thames River. Like London, Pittsburgh in the 1800's experienced a number of outbreaks of cholera. While it is probable that at least some of the cholera originated with the drinking water, it was the link between untreated water and typhoid fever that was clearly evident in Pittsburgh. In the late 1800's and early 1900's there were a large number of cases of typhoid fever and a number of resulting in many deaths in Pittsburgh. For example, in 1907, with a combined population of 535,330 people in Pittsburgh and Allegheny, there were 5,652 cases of typhoid fever, 648 of those cases proved fatal. It was disease statistics such as these, widely believed to be associated with untreated drinking water, and the highly visible contamination of the Allegheny River, that prompted residents and officials in the mid 1890's to press for the institution of a water purification system. In 1905, after years of intense argument concerning the design of the plant, construction was begun on a slow-sand filtration plant at the site of the present treatment plant on the Allegheny River near Aspinwall. By October 1908 the water supply of peninsular Pittsburgh was being filtered. In 1909 and in 1914 the Southside and the Northside, respectively, began receiving filtered water. The original plant included a river pumping station, Ross Station, a receiving basin, two sedimentation basins, 46 covered slow-sand filters, and an underground filtered water basin or clearwell. In 1912-1913, 10 more filters were added to the plant to meet the requirements of the Northside, and a contact baffle (or Reisler) pre-filtration system was installed to enhance removal of suspended solids. Chlorine began being added for disinfection was included in the treatment scheme by 1911. The benefits of filtration and chlorination of the water supply were readily apparent. By 1911 and subsequent years the annual number of cases of typhoid fever had dropped to less than 500 and the number of typhoid fever deaths to fewer than 100. With the consolidation of the Pittsburgh, Allegheny, and Monongahela Water Companies in 1908 the City faced the problem of merging three water systems and extending its filtered water service to a city divided by rivers. To serve the Northside, Aspinwall Pump Station was built at the filtration plant from 1911-1914, and began delivering filtered water to the Northside. Lanpher Reservoir was constructed in Shaler Township simultaneously to store filtered water from the Aspinwall Pump Station. This reservoir has a capacity of 155,000,000 gallons and sits at an elevation identical to that of Highland #2. The low-lying portions of the southside were fed directly from Highland reservoir #2. The old Monongahela Water Company's South 29th Street Station was relieved of this function and took over the job of pumping water to the Allentown tanks. In 1912, Mission Street Pumping Station (in the Southside) was placed into service and replaced the antiquated South 29th Street Station, which was retired. The Garfield Pumping Station and tanks were eliminated in 1912 in favor of the Herron Hill Reservoir. Then in the late 1920's, two additional reservoirs, McNaugher and Brashear, were constructed in the high district of the Northside to replace the older Montgomery, Lafayette and Greentree tanks. From the initiation of filtration in 1907 until the 1950s there was no further chemical treatment performed on the water. Only the addition of chlorine for disinfection and, during periods of acid river water, soda ash to reduce the water prior to filtration. However, by the mid 1950's, the slow sand filters had aged and became less effective. Alum treatment was then introduced to enhance removal of suspended solids, but that addition could still not keep up with the demand. The requirement to continue to provide satisfactory water pointed to a need for a modern and rapid sand filtration plant. This upgrade to the system was undertaken in two stages. 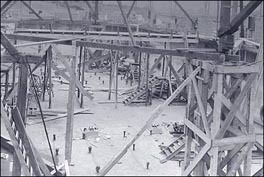 The first stage involved construction of a clarifier pretreatment system, to treat the water before it reached the slow sand filters. This structure, constructed in 1962 just west of Ross Pumping Station, provided for the first time complete chemical treatment for removal of iron, manganese, tastes, odors, and colors from the water. 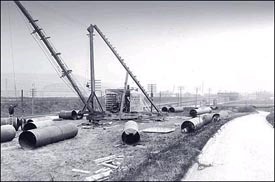 The second stage involved replacement of the outmoded slow sand filters in 1969 with a dual-media, rapid sand filtration system. The modern day Pittsburgh Water and Sewer Authority was created in 1984 absorbed the water department in 1995, and became the sole proprietor of the sewer system in 1999. 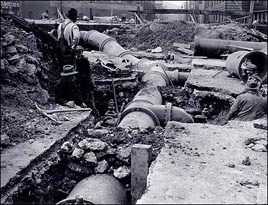 Back in the 1980s, the primary function of PWSA was to oversee a $200,000,000 capital improvement program designed to refurbish the infrastructure of the entire water system. This budget included the water treatment plant and distribution system. The program was to ensure that the water system met the rapidly expanding water quality requirements of the federal and state Safe Drinking Water Acts. One of the major requirements PWSA worked vigorously to comply with was to cover all existing open finished water reservoirs or replace them with closed tanks. Currently, all of our reservoirs are covered except for the Highland Reservoir No.1, which remains an open reservoir. At the time when PWSA was covering the reservoirs, the Highland Park community was against Highland Reservoir No. 1 being covered. For over 122 years, Highland Reservoir No.1 has been the focal point of Highland Park; a place where the public enjoys walking and recreation. The community then worked for many years with PWSA and the City of Pittsburgh and arrived at an alternative solution that pleased everyone and fulfilled all of the requirements of the state and federal Safe Drinking Water Acts. Instead of covering the reservoir, PWSA built a membrane filtration plant. With this membrane filtration plant, the water from the reservoir would be filtered through banks of microfilters before being sent to customers. The testing proved that the water leaving the membrane filtration plant would meet or exceed all water quality regulations. Thus, the Highland Reservoir No. 1 Membrane Filtration Plant went online the summer of 2002 and has the capacity to produce 20 million gallons of water per day. Today, PWSA provides quality water and quality services to approximately 83,000 customers throughout the City of Pittsburgh daily. PWSA's vision is to provide water and wastewater services that meet or exceed all regulations and customer expectations at the lowest possible cost. Currently, a goal that PWSA is striving towards is to market water to other communities outside of the City of Pittsburgh service area. This is an activity intended to move PWSA into its third century of service. In the future, it is hoped that the system can apply some of its excess capacity to becoming a regional water supplier for the greater Pittsburgh area. This goal is being realized slowly with the continuous provision of drinking water to Blawnox, Fox Chapel, Millvale, Reserve Township, portions of the Pennsylvania American Water System and intermittent provisions to a number of other neighboring communities.